You may have been wondering how to make tartar sauce. Did you know it is an easy sauce to make? I bet you have everything you need in your pantry already. 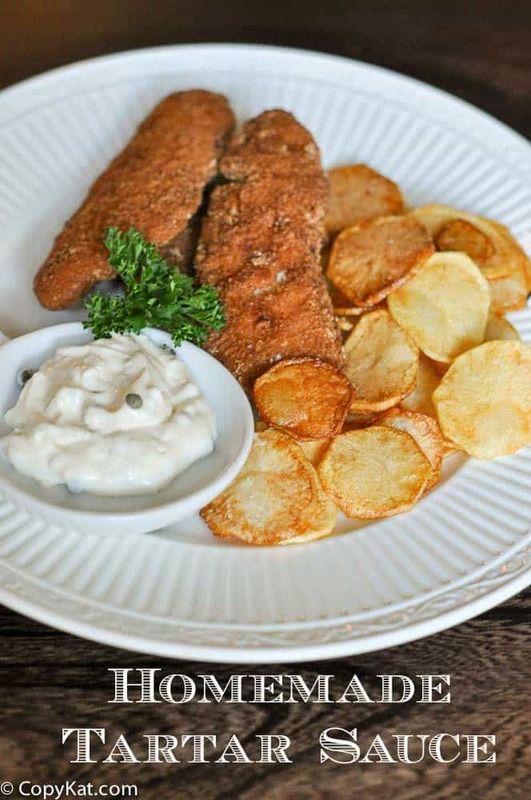 How many times have you wanted to serve up some fish and noticed you were missing tartar sauce? For me, this has happened many times. I hate going to the store for one thing, so for me being able to whip up a batch of tartar sauce is something for me that works well. I have to say I like the homemade version better than a jar of tartar sauce that you buy in the store. So it is worthwhile learning how to make tartar sauce. For this recipe, I am using mayonnaise, lemon juice, white onions, capers, and dill pickle relish. I think it is very important to use white onion if you have them on hand. White onions tend to have less heat than yellow onions. I feel if you are going to be eating raw onions you should always use white over yellow onions. This recipe has capers in it; capers are a wonderful addition to tartar sauce. Capers come from the caper plant and are pickled flower buds. They have a unique flavor that works well in this sauce. You can also use capers in Chicken Piccata. I think this recipe works best if you can make it a few hours in advance. The flavors get the sauce to develop, and it is good when first mixed up but like many other dishes some things taste better the second day. I find this stays well in the refrigerator for a couple of weeks when left in an airtight container in the fridge. I think this tastes amazing on a hamburger instead of your traditional mayonnaise, mustard, and ketchup. I hope you give this recipe I try. I bet once you see how easy this is to make you won’t buy the sauce in the jar anymore. You can make great tasting tartar sauce at home, don't buy tartar sauce in the jar. In am small bowl combine mayonnaise, dill pickle relish, white chopped onion, capers, and lemon juice. Stir to combine. Store in an air tight container for a few hours before serving. Have you ever tried the tarter sauce from the Market Broiler. My absolute favorite. I am sorry I haven’t tried this before. When I travel I will have to keep it in mind. I never measure anything when making tartar sauce. I also use homemade sweet pickle relish instead of dill. I’ve never tried adding capers. Sounds just like what I make at home except I leave out the capers. Capers are SUCH a nice add to so many recipes! Always in the refrig. Experiment!! Might be a good idea to contact a name brand mfg. like Kraft or one of the other biggies. I add horseradish sauce, a little whole grain mustard and a dash of hot sauce as well! Girl, this is fantastic!! The variations sound good too, but this is really yummy. I never thought of adding the capers either. Thanks! Capers are often forgotten about, but I personally love capers. Ooo, I bet that was delicious! I need to try that. I worked for Morrison’s Cafeteria in 1979, and made their tartar sauce daily. In addition to mayonnaise and sweet pickle relish their version also contained finely minced cabbage, and a bit of onion. The difference in texture is interesting. I want to try the minced cabbage. I wonder if they did this for texture or for food cost reasons. It was for texture, adding the cabbage and onion also adds cost. Morrison’s goes through a lot of tartar sauce , it wasn’t unusual to make 5 or more gallons each day. Morrison’s tartar sauce was so good. I never tasted cabbage. Sometimes if people chop it up very fine you can’t really taste it, but it adds bulk and texture. Would love to have the recipe. I make almost the same thing but I never thought to add the capers before! Next time I have some on hand I will add them in, thanks for the recipe. I love capers, and if you buy them at Costco, they are reasonably priced. What do you like to serve your fish with?